Associated Press GANDER, Newfoundland - A DC-8 charter full of U.S. soldiers returning from the Middle East crashed on takeoff and exploded Thursday near Gander International Airport, killing all 258 aboard and scattering gifts and weapons across snow-covered woods. Families and friends learned of the disaster as they assembled for a brass-band welcome at the headquarters of the 101st Airborne Division at Fort Campbell, Ky., but carried on with plans for a Christmas music concert as a tribute to the dead. Airport employees recalled hearing the exuberant Americans singing carols as they crowded into the duty-free shop. "Just about every one of them bought some little thing to take back home," said cashier Cynthia Goodyear. "They were just so happy to be going home." Cause of the 5:15 a.m. EST crash remained under investigation, but the White House said preliminary reports showed no indication of sabotage or an in-flight explosion in history's eighth-worst aviation disaster. The charred cockpit voice and flight recorders were recovered and were taken to Ottawa for analysis, said Peter Boag of the Canadian Aviation Safety Board, who was directing the investigation. Boag's deputy, Dave Owen, said late Thursday night that 40 percent of the bodies had been recovered. He described the flight recorders as being "in relatively good shape." The charter flight operated by Arrow Air of Miami carried members of the 101st Airborne who were being rotated home after six months service in the multi-national peacekeeping force in Egypt's Sinai peninsula. Military authorities said it might take a day or two to notify all the next-of-kin, as as long as a week to identify remains. CBC television showed debris smoldering in the snow beneath tall evergreens in sparse, hilly woods where the plane went down about a half-mile from the runway near Gander Lake. Airport manager John Pitman said the aircraft carried 101,000 pounds of fuel on takeoff. Roads to the airport were blocked and emergency vehicles with yellow lights flashing stood by as shivering rescue workers searched in vain for survivors. Smoke lingered in the air hours after the crash. "There was a flash, just like a sunburst," said Judy Parsons, a car rental agent who witnessed the crash from the Gander parking lot. "It lasted for just two seconds and then I heard an explosion. There was a lot of black smoke." 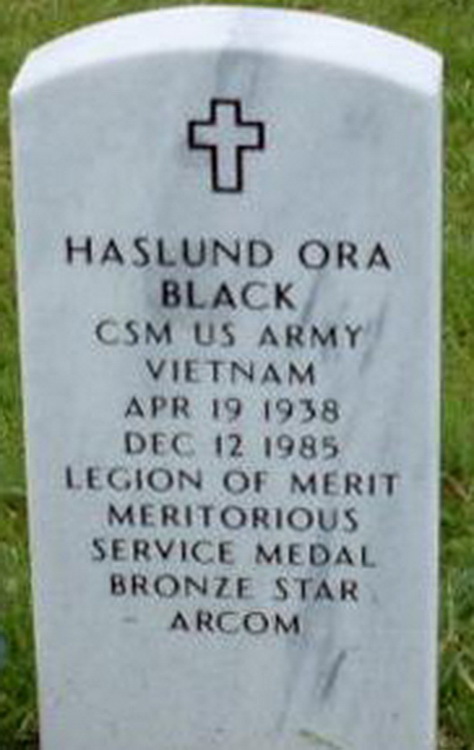 Grave marker for Haslund O. Black in Section 04 Site 104, Kentucky Veterans Cemetery, West Hopkinsville (Christian county), Kentucky. Sgt Black was transferred to Company A, 508th PIR from the Third Replacement Depot on 9 Feb 1945 while the company was ion R&R in Stavelot, Belgium. Although nothing is known of his service prior to joining the 508th, his timing was excellent as the regiment moved to Sissonne, France three weeks later and saw no further combat duty. Hilton's military decorations include the Combat Infantryman Badge for action during the campaign, 18 December 1944 to 20 February 1945, effective 15 Feb 1945.